Mycoplasma contamination represents a significant problem to the culture of mammalian cells used for research. 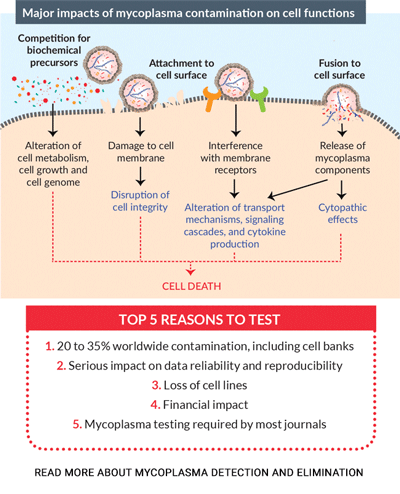 Mycoplasmas can cause disastrous effects on eukaryotic cells as they can alter every cellular parameter leading to unreliable experimental results and potentially unsafe biological products. Mycoplasmas cannot be detected by visual inspection using a normal light microscope and thus, can remain unnoticed in the cell cultures for long periods. Mycoplasma contamination can be efficiently and rapidly eliminated with the Mycoplasma removal agents, Plasmocin™ or Plasmocure™. They combine two antibiotics that act through different mechanisms and allow mycoplasma eradication in only 2 weeks. InvivoGen has developed PlasmoTest™, a cell-based assay that provides a simple, rapid and reliable method to detect all mycoplasma species known to infect cell cultures. InvivoGen's anti-mycoplasma products are suitable for research purposes only, and not for human or animal care.